How times change. 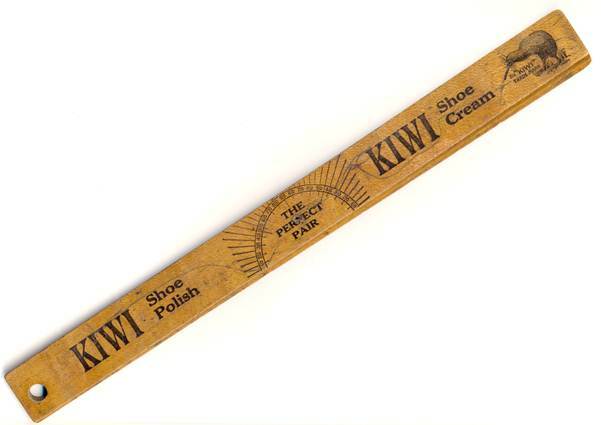 As a teenage lad I had to polish my school shoes every day. These days I try to avoid ‘posh’ shoes so shoe polish rarely comes out, although it is quite satisfying when it does appear. My grandfather was a cobbler by trade. It wasn’t really what he wanted to do. Before First World War service he had been a postman but the land fit for heroes that he returned to found no job for him. He had some skill with shoes and got a job as a cobbler. He stayed at the work for the rest of his working life. I suspect it was thanks to Grandad that we had good foot rules – and here’s one of them. Actually, it probably wasn’t the best ruler around but I always loved that good foot rule pun. I rather liked the picture of a kiwi on the reverse as well. I am delighted still to have this ruler which is seldom, if ever used. Like many a wooden ruler it has a compass hole bored through it at its balancing point. This boring was probably done in a lesson with the same, boring, adjective. Of course, you could irritate the teacher by spinning the ruler on the compass once the hole was there. This entry was posted on February 22, 2013 at 6:54 am and is filed under Genealogy, misc. You can follow any responses to this entry through the RSS 2.0 feed. You can leave a response, or trackback from your own site.